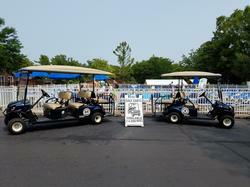 Golf carts are the primary choice of transportation on Put-in-Bay. The unofficial estimate for number of golf carts on the island is over 800. There are many sizes to choose from depending on your transportation needs. We offer 4- and 6- person carts. We also offer a special rate when you reserve your cart online through our partner website here, so save some money! Proudly serving ONLY Island Club Rentals guests with a confirmed reservation! Ask anyone who has visited Put-in-Bay even once, and especially those who've been visiting regularly since they were kids, to name particular reasons for the island's special tourist appeal, and almost without fail golf cart, or "golf cars", make the short list. It is easy to understand the appeal of golf carts on the Island. Full-sized automobiles, buses, and delivery trucks are severely restricted on the island due to a lack of parking, and golf carts are the primary motorized means of transportation and will fit in to the snuggest of spaces. 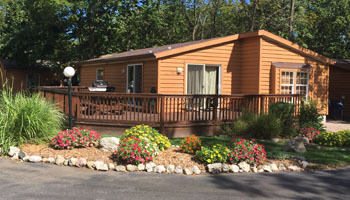 Most island residents themselves own only golf carts for transportation, which explains what may at first seem like unusual tiny driveways at most homes in Put-in-Bay's residential areas. With golf cart speeds restricted at just about 15 miles an hour, and in-town speeds equal to that, traffic in Put-in-Bay moves at a gentler pace. Were it not for the lively social scene to be found all around the downtown area, the golf carts might bring to mind a retirement community on an island. But most people are more often moved to compare the gentle putt-putt of golf carts up and down the town's streets to the childlike wonders of Disneyland and their slower rides into Tomorrowland! Give yourself plenty of time to tour the entire five-square-mile island. Be on the lookout for the occasional pothole and the speed bumps at the south end of the island. You don't want the person riding in back to get hurt. Above all, be sure to always drive on the right side of the road and take your keys with you when you leave the cart. It is best to make advance reservations for a golf cart during busy seasons. Ask your rental contact or agent who they recommend and whether they can make reservations for you. With a widely available tourist map in hand or downloadable Put-in-Bay Island Guide from our website, begin your adventure by cruising up and down the streets of the main downotown business area to get the hang of the cart. Then explore some of the charming residential cottages. Finally, head for the hills, literally, and explore the winding hilly roads in the center of the island and find putt-putt golf, wineries, caves, vineyards, antique schoolhouse, ice cream shops, and much much more. All these farther-flung routes will yield breathtaking views, without the need for you to stop to catch your breath after what would otherwise have been a healthy hike! Our weekday overnight rate (3 PM – 11 AM) for a 4-person cart is $70 plus tax. Our weekday overnight rate (3 PM – 11 AM) for a 6-person cart is $90 plus tax. Our weekend rate (3 PM Fri - 11 AM Sun) for a 4-person cart is $160 plus tax. Our weekend rate (3 PM Fri - 11 AM Sun) for a 6-person cart is $200 plus tax. Our weekend rate (3 PM Fri - 11 AM Sun) for a 8 person cart is $240 plus tax.